Some taxpayers don’t get a refund after they file because they didn’t pay enough to the IRS throughout the year—and that means a tax bill when you file your return. Tax reform has benefitted many, but others have been blindsided with bigger tax bills than they anticipated. That April 15 deadline marches on and demands to be met, so how do you handle a bill you just can’t afford? The penalty for not filing your tax return is actually higher than the penalty for not paying your taxes, so don’t let a tax bill you weren’t expecting keep you from filing your return before April 15. The failure-to-pay penalty is 0.5% of your unpaid taxes per month, and the failure-to-file penalty is 5% of your unpaid taxes per month. If you’re not ready to file your taxes, either, consider filing a tax extension, which will give you an extra 6 months to file. It’s true that any taxes owed are due on April 15, but there are ways to pay your bill before or after you file your tax return. If it’s possible to pay the remainder of your taxes owed in a few months, the penalties for paying late won’t rack up too high and you can take care of it over time. You can pay your bill using a debit or credit card through IRS-approved payment processors, and you don’t have to submit the entire amount you owe up front. There is usually a small fee for each payment, but it’s worth the ability to pay what you can. Tax bill gonna take longer to pay off? There’s an action plan for that, too, and it’s called an online payment agreement. Short-term payment plans are for those who owe less than $100,000 in combined tax, penalties, and interest and can pay in less than 120 days. Long-term payment plans are for those who owe less than $50,000 in combined tax, penalties, and interest and will take more than 120 days to pay the balanced owed. You can apply for an online payment agreement on IRS.gov. But what if I still can’t pay my tax bill? In extreme cases, some taxpayers are simply unable to pay back what they owe, even given time and the option to pay in installments. For these, an offer in compromise may be your last-ditch effort. Offers in compromise allow you to settle your tax debt for less than the full amount you owe. The reduced bill is calculated by your ability to pay, income, expenses, and asset equity. This sort of deal may sound nice—“oh sweet, I can just not pay as much!”—but the process of submitting an offer, being current with legal requirements, and starting from square one if your offer is rejected can be difficult. The IRS urges taxpayers to explore all other payment options before attempting an offer in compromise, and you can read more about it on IRS.gov. So, what’s the biggest takeaway? File your taxes, even if you can’t afford the tax bill—there are ways to break that bill into chunks, but avoiding filing your return will only complicate the issue and add penalties. 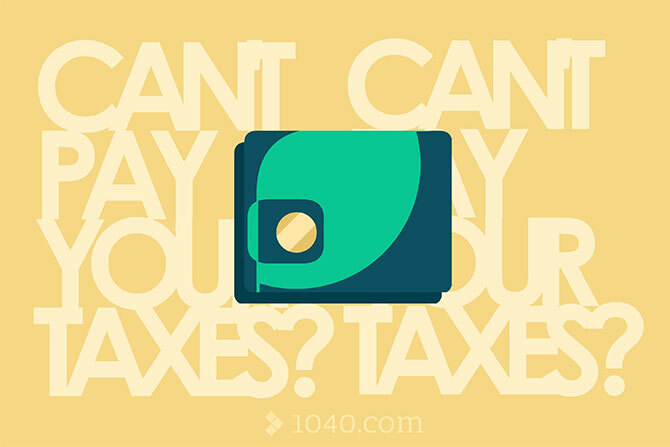 Why not get it done and file the simplest way possible with 1040.com? 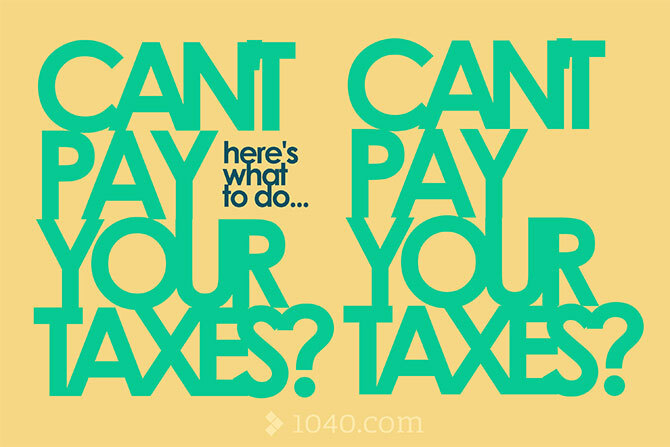 We’ll walk you through your taxes, and even if you can’t pay your bill, we’ll show you how to get started.